Here we are, with a very colorful post...still in holiday mood, for a very colorful summer ! 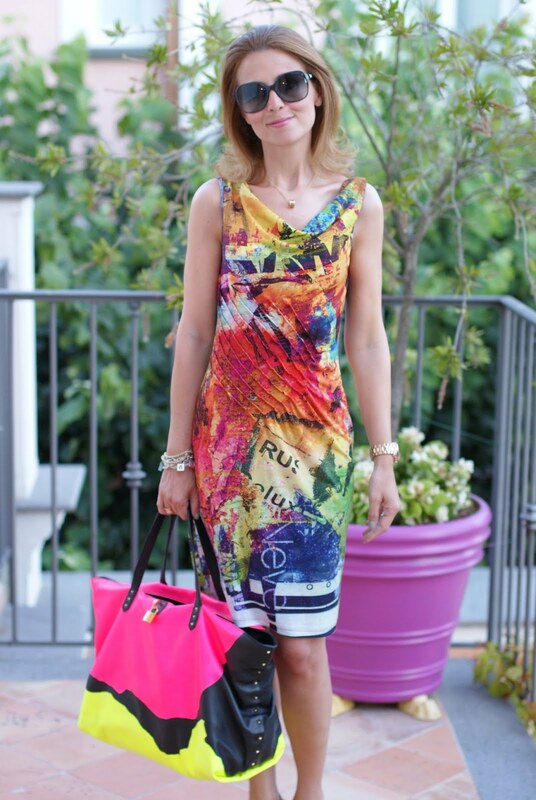 Here I am wearing a printed dress from Eroke and comfy neutral wedges from Cesare Paciotti 4US. Click on each image to enlarge it !. Eccoci con un post molto colorato...ancora in modalità vacanziera, per un'estate ricca di colori !. Quì indosso un abito stampato di Eroke e zeppe in corda color carne di Cesare Paciotti 4US. Cliccate sulle immagini per ingrandirle !. I confess I have decided to bring my large Marc Jacobs tote with me because I had all the things I needed for a day at the beach inside of it...;-)...the bag added even more color to the whole outfit but I enjoyed it because after all it was for daytime and precisely for eating on a restaurant on the beach. Confesso di aver portato questa grande borsa di Marc Jacobs con me principalmente perché può contenere tutte le cose di cui necessito per una giornata in spiaggia ;-)...la borsa ha aggiunto ulteriore colore all'outfit ma non l'ho trovato eccessivo in quanto si trattava del giorno e, più precisamente, di un pranzo informale sulla spiaggia. I love fashion but I also love good food and trying new restaurants is something I enjoy very much !. My love and went to lovely "Lo Scoglio", a restaurant on the sea and I had the most amazing spaghetti with courgettes ever tried in my life. I had to take a picture, also because in that place my beloved Instagram was not working properly !. Eating well is, just like shopping, one of the best pleasures in life, don't you agree ? ;-). Amo la moda ma amo anche il buon cibo e provare nuovi ristoranti mi appassiona molto !. 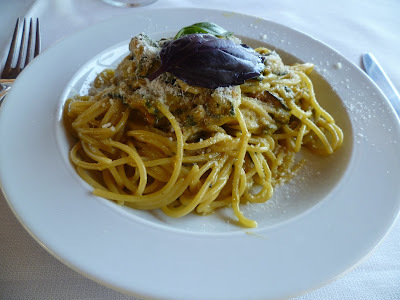 Con il mio amore siamo stati a "Lo scoglio", un ristorante delizioso sul mare e io ho mangiato il migliore piatto di spaghetti alle zucchine mai provato in vita mia. 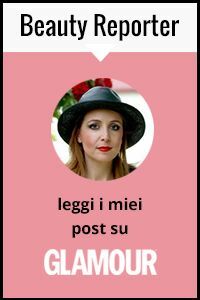 Ho dovuto fare una foto, anche perché in quei luoghi il mio adorato Instagram non funzionava !. Mangiare bene è, insieme allo shopping, uno dei migliori piaceri della vita, siete d'accordo ? ;-). 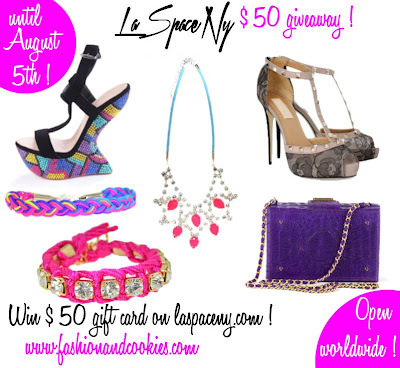 REMINDER: LASPACENY $50 GIVEAWAY ! Let me remind you that thanks to the lovely online boutique LASPACENY and Fashion and Cookies you can win a $50 gift card to buy whatever you want on LASPACENY.com !. Their items are so beautiful, there's so many cool things you could get :-). This Giveaway is open worldwide, up until August 5th and you need to fill in the Rafflecopter form you can find clicking here ;-). ...molto bello questo tuffo nel colore, ma perdonami sto sbavando su quel piatto di spaghetti allo scoglio!!! Mi manca l'Italia: e' ufficiale!! I love that dress, what a gorgeous summery print! The food looks delicious, it's making me hungry haha! aaaaaaah che fame m'hai fatto venire!! you look very much the colorfull dresses !!! I like this colorful post, and outfit. Sono stupendi gli abii cosi colorati... molto estivi e molto allegri! I even have a small food club with my man and our common friend. The food looks amazing, and so do you! That dress is so vibrant and fun! Wow...che STILE! Riesci ad interpretare al meglio la Magia della Moda!! Cinquanta sfumature di Colore ad Incorniciare la Tua Bellezza...Cheers! Questa esplosione di colore la adoro .. bellissima!!! super cute outfit! that bag is gorgeous, love the bright colours, totally need to invest in one like it, looks amazing! The the bag and dress separately just no together. Lovely look and amazing dress! Beautiful dress! It's like the rainbow just gave you a hug! Fashion and great food do make a wonderful combination. Love the colorful summer dress. You look very summer ready! A parte i tuoi outfit sempre impeccabili.....hai un sorriso invidiabile!! THE SPAGHETTI WITH CLAMS AND MUSSELS LOOKS DIVINE, AS DIVINE AS YOUR DRESS! just love ur tote,and u look stunning in those burst of colours ! great dress, as always :) beautiful beach! la sua borsa é cosí amazing!! Che colori!! Grazie per il tuo commento. Bellisimo abito. I love your blog. We can follow each other if you want. Hi hun, thank you for the comment but I am already following you on GFC following now on bloglovin :) I would love you to do the same for me if you would? I have already liked your facebook page also! Thanks for stopping by my blog and commenting :-) great to meet you! Love your outfit and your blog is delightful! Have a great week! Your bag is too cool! cute pictures as well! your dress is super colourful and vivid,i absolutely love wearing something like that in summer. Never a dull moment!!! and u're right - a big bag has it all. just perfect for a short trip to the beach! That's a really great dress! Love the Marc Jacobs bags. The colors in it are exquisite. Yummmy food! I love all of the color in this dress. It's gorgeous! I think you and I share the same fashion taste, I like flora and bright dresses as well, and they look so good on you!! what a lovely dress dear!!!! Love the dress.. great colorful vacation vibe and I TOTALLY agree about food..I am a total foodie.. Thanks for your kind comment at my blog! I like your style....and your taste in food! Love the bag! Very cute dress! Thanks for the well wishes on my last blog post! Nice dress! Would you like to follow each other? Your dress is beautiful- and your holiday looks beautiful too! Wow, what a beautiful dress. I love your outfit! Especially your bag!! What if we follow each other? What a stunning dress and such a brilliant bag too! Thanks for commenting on my blog would you like to follow each other?